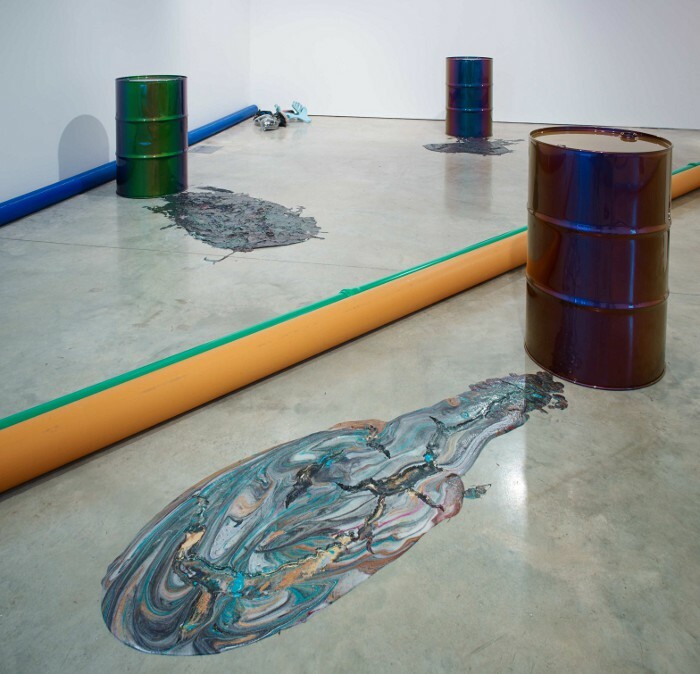 Brightly coloured plastic pipes stretch between scattered oil drums, across the gallery floor, and beyond, to the boardwalk patio and pond outside. Psychedelic-coloured slicks spill out, like puked-up ice-cream re-solidified. 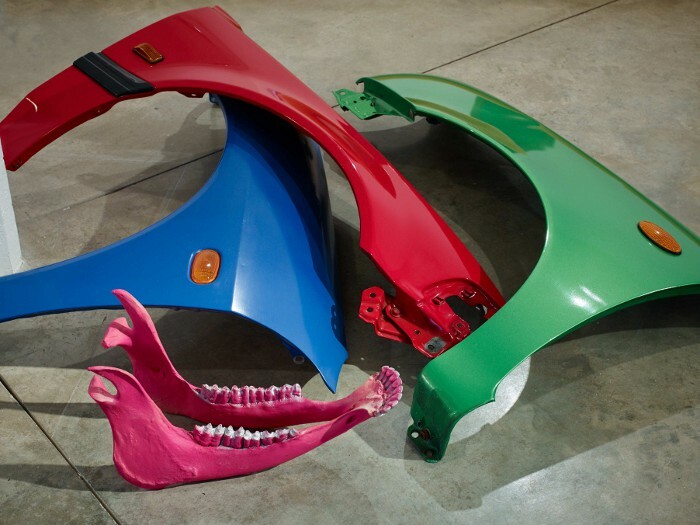 Car parts- hoods, panels, lights- are strewn amongst animal skulls and bones in fluorescent hues. 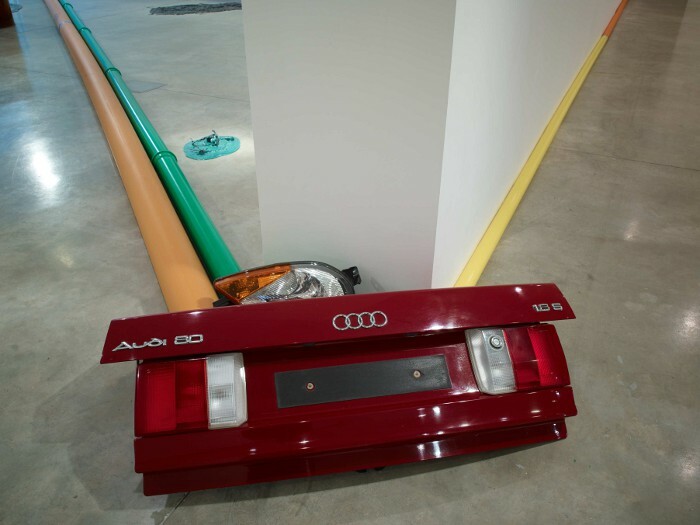 This is the vast installation that Jimmie Durham, Berlin-bamsed American artist has laid spread across the Parasol Unit. 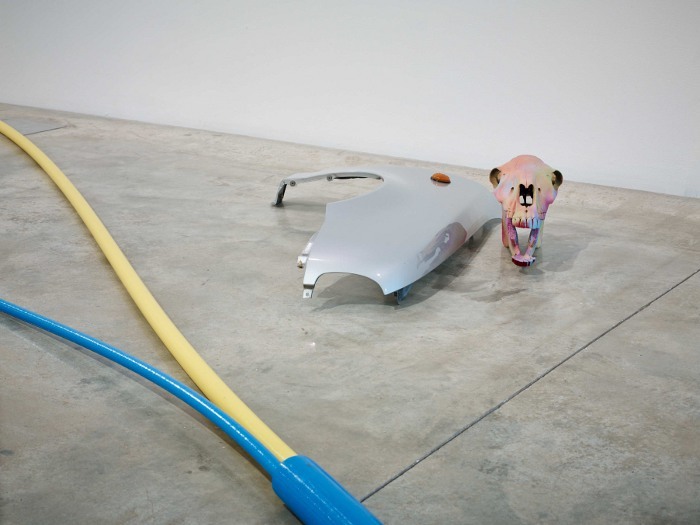 Durham was inspired by philosopher Walter Benjamin identifying the rainbow swirl of colour in oil on puddles as signs of modernity, but he also recalls the desolation of the American West and the skulls in the desert by the highway, themes he has long explored. Born in 1940, he's seen a lot, and is a veteran of campaigns for the what we now call America's First Nations. He continues to experiment. In the upper gallery, white screens around the walls are smudged with strange shapes- what are they? Paw prints? Look closely and you see furry animal forms. He smothered soft toys in soot and threw them to get the effect. The result is simultaneously cute, sad and ethereal, like impressions left by animal spirits. And then there is his seminal absurdist film, Smashing (2004). Formally dressed, Durham sits deadpan at a nondescript desk as people present objects which he smashes with a stone, then with understated flourish, he signs, stamps and issues each a certification document. It grips you. What will he smash next? Mesmerising, violent, anarchic, and silly, it is simply one of funniest conceptual art performances ever filmed. Jimmie Durham's art is as dry as the American desert but vibrantly alive, charged with a dangerous, contemporary energy. He shows us the violence western civilisation wreaks upon the Earth, and we can swallow the message because he delivers it like a magician. He makes it look wonderful. 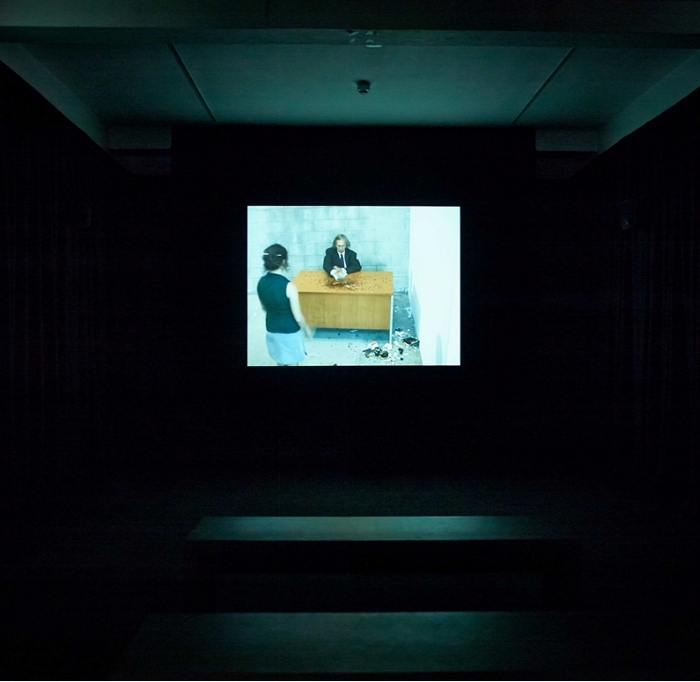 Traces and Shiny Evidence is on at Parasol Unit, London until 9 August 2014.